The answer to the mentalist's dreams! Available once again is Nelson's perfect, undetectable means of immediately securing full knowledge of written questions and detail. Spectator simply writes a question, seals it in an ordinary envelope and retains it. At no time does the mentalist so much as touch the writing or sealed envelope. Yet, in a flash, the mentalist has full knowledge of the written data. 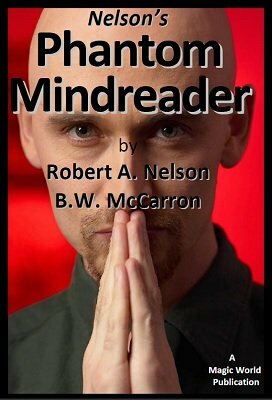 Nelson's Phantom Mindreader does the work for you. It truly is a 'Phantom'; as it is never seen by the audience. It delivers the message to the mentalist in seconds in a most natural, unsuspicious manner. Remember, there are no carbon papers • no switching • no center tears • no handling of the spectator's written question • no funny moves • no stalling • no electronics • no stooges • no assistants • truly a one person effect! Use it on the street corner, club, parties, for shows, or wherever people gather. A perfect impromptu demonstration for people who pin you down and say "Read my mind!" This is a behind-the-scenes look at an actual Phantom device from the 1960s, illustrated with color photographs, plans and sources of supply to construct your own. Also included is the actual content from Nelson, including suggested patter. Are you a Nelson collector? This was Item Number 658 in the Nelson Enterprises catalog . Now you can fill that missing spot in your collection. 1st edition 1961, updated and expanded 2016, 21 pages. Well, I must say the idea is not new. But materials are really hard to find to make this gimmick. Also describtion is a little misleading. I did not learn anything new as I was already using this on a book test. Also another product so kind of disappointed. So I get nothing new. Also building the gimmick is much of a pain.